Log Book Servicing is one of those aspects of maintaining a car that is often ignored by a majority of car owners. While maintaining a log book may not be a legal necessity, it sure is an important responsibility and important to maintain the smooth running of your car and also to keep your warranty intact. 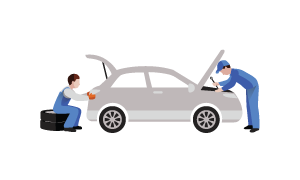 At Dr. Roadworthy, we offer a friendly, fully qualified service by experienced mechanics. People are often misled to think that in order to keep their warranty valid, they need to get their car serviced only at the dealership that they bought the vehicle from. This is not true. You can get your car serviced elsewhere and still keep your warranty intact. Our experienced mechanics are able to sign off you log book, ensuring that you have both a smooth-running vehicle without breaking the terms of your warranty. What Is Meant By Log Book Keeping? Log book servicing is a comprehensive form of vehicle servicing that examines your vehicle while following the manufacturer’s log book schedule and specifications as mentioned in the statutory rulebook. In order to keep your warranty active, it is important to keep your car in a good working condition and maintain a log book servicing book. Unfortunately, several vehicle owners don’t seem to realize that regular servicing is an important aspect in maintaining the good working condition of a car. Most drivers are not skilled in the working of their vehicles and do not maintain a schedule for the servicing of their vehicles. The truth that people need to understand is that in order to be able to increase the life-expectancy of a vehicle, it is important to stick to the log book servicing schedule. Log books are probably the most reliable documents that every buyer will inspect when you decide to sell your vehicle. It exhibits the proper maintenance of the vehicle. Therefore, apart from being an important part of maintaining the safety of your vehicle, keeping an up to date log book service is will prove useful in reaching a higher resale value of the vehicle. We provide log book services for not only cars but also motorcycles, caravans, trailers, and HVRAS. The team of mechanics and workers involved in all areas of services at Dr. Roadworthy has years of technical and practical experience and are chosen from a group of industry experts. We at Dr. Roadworthy believe that “quality” is the battle cry of our business. All our services are put through quality checks before reaching the customers. There are 0 comment. on "Log Book Services"